Download this free e-book to begin your digital marketing journey today! LinkedIn has become one of the most important platforms for building thought leadership and making connections. With more than 300 million users, and more joining daily, LinkedIn is an important platform for any professional. Are you using LinkedIn effectively and efficiently? To what end? 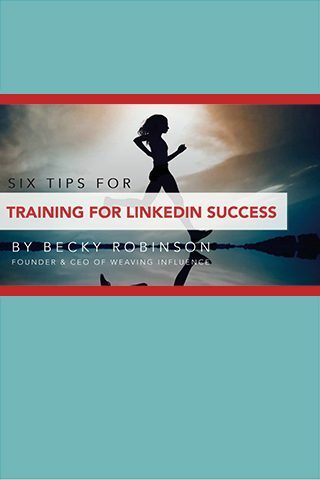 This e-book resource by Becky Robinson provides 6 easy-to-implement tips you can try today to increase your effectiveness on LinkedIn. Approach online influence-building like you would train for an athletic event. This resource incorporates best-practices for endurance training. We believe you’ll be energized and motivated by this unique approach and that you’ll take action on what you read.